You worked hard so you could drive a luxury car. In the world of luxury sedans, even the minutest detail is of the utmost importance. That's why more Oklahoma drivers choose the Audi A5 over competing models like the Mercedes-Benz C-Class. The Audi A5 is the luxury sedan to drive. Find yours at Audi Oklahoma City. The 2018 Audi A5 comes standard with a 252-HP 2.0L turbocharged 4-cylinder engine. Add to that a 7-speed dual-clutch automatic transmission and now you have a sedan that loves cornering and long sweepers while maintaining total control. And, with an EPA-estimated 34 MPG Highway, you'll spend less time at the pump and more time enjoying your ride. The interior of the A5 is punctuated by comfort in both front seats and the back as well. In fact, the rear seatback folds to increase cargo capacity, thus proving how versatile this sedan is. If having all the latest features is important to you, then the Audi A5 is the luxury sedan for you. The available Audi virtual cockpit is one such feature. Its full digital 12.3-inch instrument panel enhances your ride with customizable information displays like audio, navigation (including Google Earth™) and more. You won't find technology like this in the Mercedes-Benz C300. The Audi Virtual Cockpit is an Audi exclusive. The 2018 Audi A5 offers a host of advanced driver assist technologies that can help you stay safer on the roads in Oklahoma City and beyond. Standard and available features include Audi Pre Sense®, city traffic jam assist, traffic sign recognition, night vision assist and Audi active lane assist, among others. All these features led the 2018 Audi A5 to be ranked as an IIHS.org Top Safety Pick! 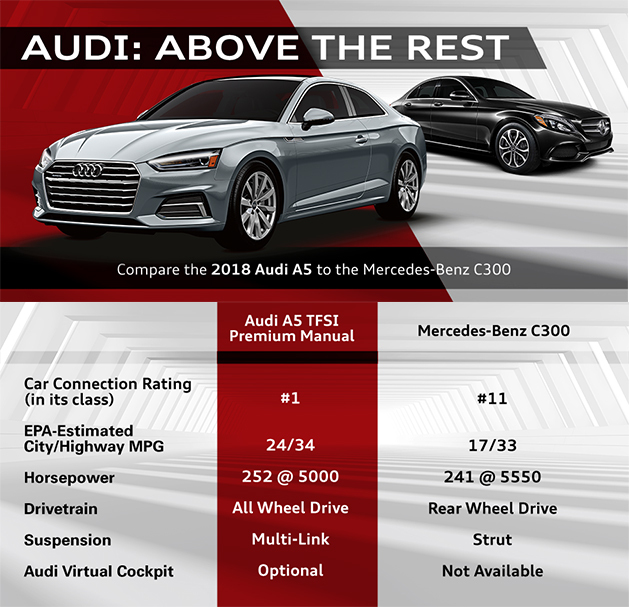 Now that you have read how the 2018 Audi A5 stacks up against the Mercedes-Benz C300, we're confident you'll get your luxury sedan at Audi Oklahoma City. Click the buttons and fall in love with your next car.